The Convenience and Savings of WashCard. Here's How WashCard Can Work for You! 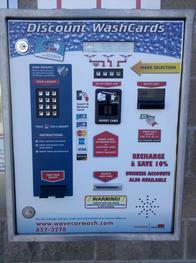 The Wave Car Wash features the WashCard system. Enjoy the speed and convenience of WashCard. Don't worry about having the correct change. Buy a pre-paid WashCard Buy a pre-paid WashCard and save 10%-20%. It's easy, fast, and convenient. 1. Insert and Remove your Washcard to begin wash. (Wash can run a max 20 min per swipe) If more time is needed Insert and remove card again once the wash stops. 1. Insert and Remove your WashCard to start vacuum. ($1.00 charge) Washcard customers receive bonus double time for each swipe at vacuums. 2. Insert and Remove your Washcard. The WashCard will automatically charge your account for the selected service and activate the correct carwash. 1. Insert and Remove Washcard. 3. A receipt will print. Receive a 10%-20% discount when you purchase or recharge a Washcard. Residential and Commercial customers can purchase a Prepaid Washcard at our Washcard Purchase & Recharge center or click on purchase a WashCard online or by calling our order line at 775-857-3278. It's quick, it's convenient and it's easy! If you already have a WashCard, register it here. You will be granted access to your very own WashCard Account Manager. Once inside this secure area, you can check your balance, add value to your WashCard account and even review your account history. The online Account Manager is perfect for managing large Fleet Customers and Commercial Accounts or for families who have more than one card. There is no limit to the number of cards you can have! Business and Commercial Accounts receive additional benefits. With WashCard Online, a detailed invoice is sent to your business, allowing you to view the date and time of each wash within that billing period. You can even track wash activity online by logging into your secure account. Each card in your account can be programmed for an individual person, vehicle or department. And remember… you can have as many cards in your account as needed. No extra charge! Put a WashCard in every vehicle. For your convenience , WashCard is good at both locations, 24 hours a day, 7 days a week. WashCard saves time and money. Contact us today; we can design a WashCard Program to meet your specific vehicle cleaning needs. To request more information on prepaid discount Washcards and monthly billing accounts, please call 775-857-3278. Get Clean at The Wave Car Wash!